The concert opened with performances from Leland, an American singer-songwriter, and Kim Petras, a German artist based in Los Angeles. Leland and Sivan worked closely together on many songs from both “Bloom” and Sivan’s debut album, “Blue Neighbourhood” (2015). Boston was also the last stop on the “Bloom” tour where Leland would be performing, and he certainly made it memorable. Sporting a rainbow-colored tee and baggy jean shorts, Leland quickly captivated the initially hesitant crowd, transforming the theater into a wild dance floor as he let loose uninhibited dance moves. Then, 26-year-old Petras took command of the stage with powerful vocal chords, a short black skirt and color-changing sunglasses. By the end of Petras’ seven-song performance, none of the crowd’s initial restraint remained. The theater was dark, waiting for Sivan. The stage and audience then gradually became engulfed in different hues of blue in wave-like motions and faint, echoing music. Breaking the tranquility of the underwater scene, Sivan stepped out from behind the curtains as the lighting changed to a crimson red to match the color of his suit and pants. The audience screamed as he uttered, “I got these beliefs that I think you wanna break,” the first words in the album’s opening song “Seventeen.” As the song progressed, the curtains dropped to expose the rest of the stage and the band. He then quickly moved into “Bloom” as misty lights swept over the audience, mimicking the mystic mood of the “fountains and the waters” of his “garden,” as portrayed in the lyric video. Prancing and spinning around the stage, Sivan took off his suit during “Plum,” revealing a white long-sleeved shirt underneath and transitioning to the next act of his performance — one that was much more tender. Only after “Plum” did he take a break, finally speaking directly to the audience, recounting how some of his favorite shows had been in Boston and encouraging the audience to get up from their seats to dance. Sivan continued the show with “Heaven,” a throwback to his debut album and a ballad about his own coming out experience. In one of the most poignant moments of the show, thousands of audience members held up different colored paper flowers in front of their phone flashlights in form of the pride flag, as rainbow-colored stage lights shined back toward them in solidarity. The image of Sivan’s silhouette between these lights, juxtaposed with statues of angels above and to both sides of him and amidst a theater replete with elegant Renaissance-themed art, was striking, as he sang “If I’m losing a piece of me / Maybe I don’t want heaven.” Touched, Sivan invited the teens who organized it onstage, sharing a group hug and a selfie, recognizing them as the “same little twerps” who had done the same thing on his last tour. With the addition of an antique couch and lamps rising up on an elevated platform, along with a beautiful keyboard solo by Karina DePiano, the intimate third act began. In a black tank top and sweatpants, Sivan sat on one edge of the couch while pianist Kaela Sinclair sat on the other, voices perfectly complementing each other in the duet “Postcard.” In the dim blue, the song’s melancholy and longing found its ways into fans’ hearts, the venue once again lit with the glow of flashlights slowly waving back and forth. Accompanied by a single guitarist sitting by the foot of the couch, he next performed “The Good Side,” a song expressing apologetic sympathy to a past lover after a rough breakup. With blinking stars rising and dropping, and pink lights beating to the rhythm of the thudding drums, not a single eye in the crowd was dry. In response to his moving on as expressed in “The Good Side,” “What a Heavenly Way to Die” talks about his timeless, eternal love for his current lover as he laid sensually on the couch, arms stretching out in gentle lust, singing “I wanna be with you.” In the last song of this act, Sivan performed “COOL” for the first time on tour this year; carefree dancing mirrored the song’s youthful spontaneity, seamlessly transitioning this act’s delicacy to his forceful final act. Now in a white tank and black pants, Sivan steadily navigated the stage in “BITE” while menacing white and orange lasers shot through the blackness. He then brought back full 90s nostalgia in neon purple and blue as everyone clapped along to his newly-released bop with Charli XCX, “1999.” He even spotted a fan dressed as he did in the music video imitating a young Justin Timberlake. Asking the audience to dance along with him, he turned the theater into a disco floor with spinning lights during “Dance to This” and ended the act with a heartfelt performance of his personal favorite song from the album, “Animal,” crouching down to engage with fans. The audience waved their arms and danced with surges of intense energy. As he left the stage, roaring applause shook the ground before he cheekily reappeared five minutes later, bringing back “YOUTH,” his top hit from “Blue Neighbourhood,” and finally ending the memorable night with “My My My!”. Throughout these two songs, with colorful lights zipping in and out through the cracks between each person, the entire crowd shouted out all the lyrics in unison, jumping, screaming, dancing and crying — for a brief moment, time was at a standstill, as the concertgoers were completely immersed in this getaway that Sivan created in total and perfect ecstasy. Sivan’s “Bloom” tour was an extraordinary culmination of all he has worked toward so far in both his career and life. With an exquisite but rich voice, he led Boston through everything from his identity struggles to his understandings of love and the nooks and crannies of his sexual desires. By showing a raw vulnerability of being human that seems rare in the pop arena today, his strength was ever apparent as his concert concluded with songs from both albums celebrating freedom, confidence, love and living life to its fullest. With his authentic emotion and energy, the night turned an audience of thousands of strangers into an intimate, fun get-together as he intended; the differences in background and identity among these strangers ultimately proved negligible as everyone rallied behind the universal themes and sentiments his songs relay, basking in the wonders of the present. 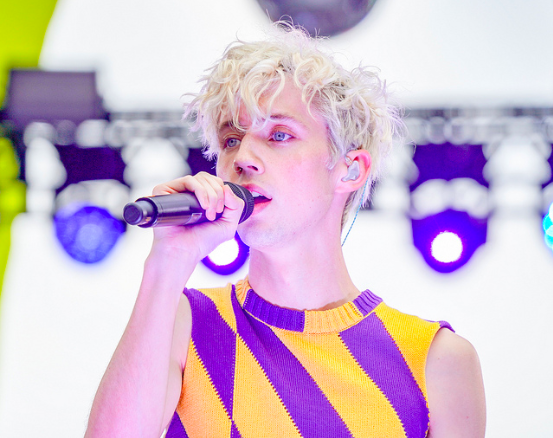 With Troye Sivan's authentic emotion and energy, the night turned an audience of thousands of strangers into an intimate, fun get-together as he intended.